Easy-to-use and extremely sensitive for early detection of pregnancy. Searching for affordable and reliable pregnancy test strips? Buy our pregnancy test strips in bulk at a mere price of 75 cents for each strip. Our pregnancy test strips provide you with an effortless and swift method to do pregnancy tests at your convenience. 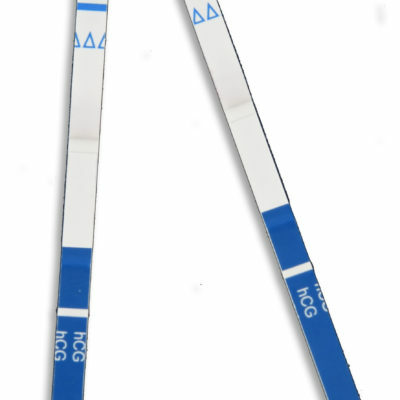 The Pregnancy test strips or hCG Quick test strip (urine-based) is a quick visual immunoassay for the qualitative, presumptive detection of human chorionic gonadotropin(hCG) in human urine specimens. Our pregnancy test strips are designed to provide assistance in early detection of pregnancy. These pregnancy test strips use human urine to aware the user as to whether or not they are pregnant. You can read the results from our pregnancy test strips in just 3 minutes. Use the pregnancy test strips immediately after removing the from sealed pouch. For accurate results, use it within one hour. Do not touch the strip membrane as it can contaminate the strip. Hold the pregnancy drug test by the end where the product name is printed. Hold the pregnancy drug test vertically and immerse it in the urine specimen for minimum 10-15 seconds. Always ensure that you do not dip it past the MAX line on the strip. As the test commences, the color will move across the membrane. After the pregnancy drug test has completed, remove the strip from the specimen and place it on an exudating flat surface. Start the timer immediately and wait for the colored band(s) to appear on the strip. Read the results at 3 minutes. Do not wait for more than 10 minutes to interpret the results. Negative: Only one colored band appears, in the control region(C) © on the membrane. No colored band appears in the test region (T). Positive: Two colored bands will appear on the membrane. One band appears in the test region (T) and another band appears in the control region(C). Invalid: Control band fails to appear. If the test results fail to produce a control band at the specifies read time, discard the test immediately. Read the procedure and instructions thoroughly and begin with a new test. If the problem persists, quit using the pregnancy drug test immediately and contact your local distributor.